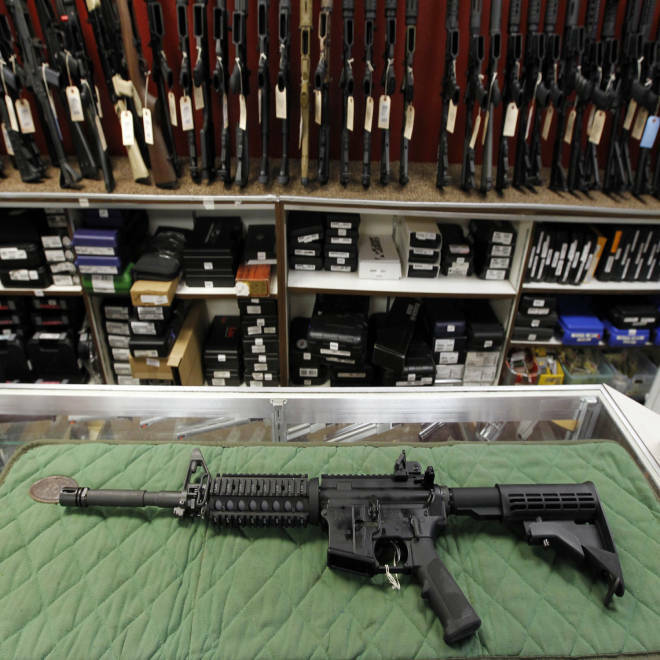 An AR-15 style rifle is displayed at the Firing-Line indoor range and gun shop on July 26, 2012 in Aurora, Colo. The movie theater massacre in Aurora, Colo., has had no significant impact on public views on the issue of gun control and gun rights, according to a new poll released Monday. The poll by the Pew Research Center for the People & the Press found that 47 percent of respondents say it’s more important to control gun ownership, while 46 percent say it’s more important to protect the rights of Americans who own guns. That is virtually unchanged from a survey in April, when 45 percent prioritized gun control and 49 percent gun rights. Dhavan Shah, a communications and political science professor at the University of Wisconsin-Madison, said the results show that despite tragedies like the July 20 massacre in Aurora, which left 12 dead and scores wounded, public opinion on guns is deep-seated and rigid. Other recent major shootings also had little effect on public opinion about gun laws. According to Pew surveys, there was no significant change in the balance of opinion about gun rights and gun control after the January 2011 shooting in Tucson, Ariz., in which U.S. Rep. Gabrielle Giffords was injured. Nor was there a spike in support for gun control following the shooting at Virginia Tech University in April 2007. The latest Pew survey, conducted July 26-29 among 1,010 adults in the U.S., also showed that relatively few Americans view the shooting in Aurora as part of a broader social problem. Rather, 67 percent said that shootings like this are isolated acts perpetrated by troubled individuals. This is similar to public reaction after the Tucson and Virginia Tech shootings, when 58 percent and 47 percent of poll respondents, respectively, viewed them as isolated act by troubled individuals. Shah, an expert on the social psychology of media influence and communication effects on political judgment, said the findings in the surveys highlight the public’s focus on the trivial rather than fundamental issues. Public opinion about gun rights has been politically divided for years. Republicans prioritize gun ownership rights by a 71 percent to 26 percent margin, according to Pew, while Democrats prioritize gun control by a 72 percent to 21 percent margin. Independents are less polarized, with 50 percent saying the priority should be protecting the rights of Americans to own guns and 43 percent saying it should be controlling gun ownership. Outside of a few isolated voices – primarily New York City Mayor Michael Bloomberg – few political leaders have called for stronger gun laws after the Colorado shooting and other recent gun violence, like the Fort Bragg shooting in June. The Obama administration’s reluctance to push for tighter gun laws, Shah said, reflects how far the political debate over gun owners’ rights has shifted in the past two decades. Ultimately, Shah said, despite how fluid public opinion may or may not be, the current dialogue regarding gun laws underscores the need for deeper discussions on the issue.